FYI: full moons are the Universe’s invitation to #KonMari the s*** out of your emotional life. Anything that does’t “spark joy” aka anything that isn’t serving your highest vibration is best blessed and sent on it’s way under the light of a full moon. This is true Every. Single. Month. However, tonight’s Leo full moon ups the ante in the shadow of a lunar eclipse. With the moon’s luminosity set to low, you’ll catch those sneaky cockroach habits that would normally skirt away under the full moon’s light. It’s a rare opportunity to really clean out the corners and leave no stone unturned. Think of this as your astrological New Year’s Eve and you just might wake up a whole new being. 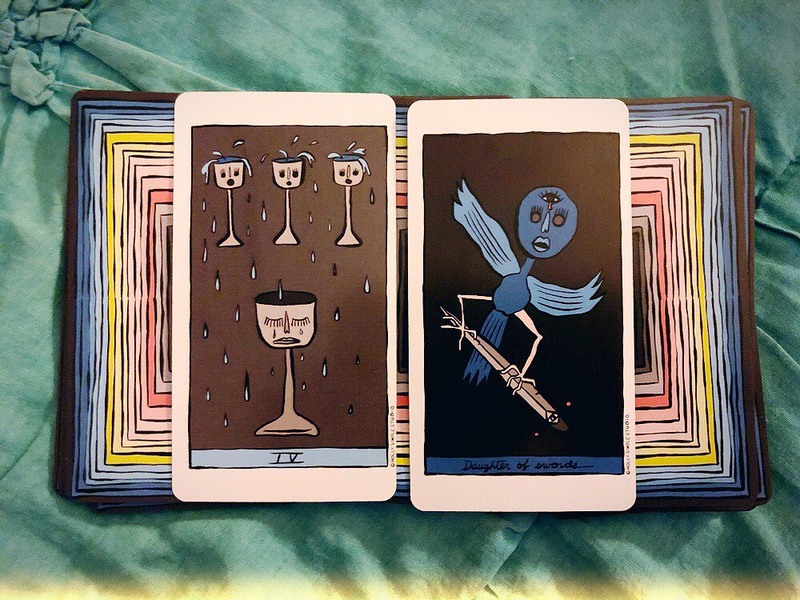 As I contemplate my own full moon madness this evening, I’ve pulled two cards from the Holly Simple Tarot to provide clarity for all of us on what we’re supposed to let go. After all, even Marie Kondo helps find the categories before a cleanse. So let’s see what the focus is this month, shall we? We are being called to contemplate the darker corners of our lives where we feel stuck, where we’ve fallen into habitual patterns without asking ourselves: “Does this action bring me joy?” The Universe no longer supports the salmon swimming en masse upstream towards whatever destination we’ve been told we should be seeking, it’s time to break free from the school. It’s as if we’ve all been copying each other’s homework waiting to be rewarded for our mediocre efforts only to discover you only get a gold star for striking out on your own. There is no rule book. There is no template. That being said, the perceptive Daughter of Swords swoops in to remind us not to be judgmental. The things we leave behind that do not serve us are not bad, they’re simply no longer a part of our road map. Bless and release your envy towards those who have the life you thought you dreamed of, but don’t resent them for being unable to show you the way. Their path wouldn’t bring you the happiness you deserve because it was manifested for and by them. Like a custom gown suited to someone else’s measurements, anyone else’s pattern would bind in all the wrong places. Be your own seamstress and create a life to fit your own needs. Unfollow everyone you’ve ever tried too hard to emulate and allow your soul to curate your existence instead. Don’t just “like” what brings you joy, live it. Itching to Request a Blog or video Topic?